Many beginner photographers tend to start learning about photography without bothering or understanding the different features provided by a digital camera. With proper knowledge about digital cameras or rather DSLR cameras, photography skills can be mastered to create outstanding compositions. So, it is essential for beginner photographers to be proficient so that they can make the most out of even the best professional cameras. With this article, the photographers can get knowledge about the basics of DSLR cameras and how to use them proficiently. Let’s first take a peek at the various features of DSLR cameras and how they can help in photography. Every digital camera using DSLR technology provides shooting modes that can be found on a dial labelled as Auto, AV, TV, P, M and more. They determine the way a digital camera behaves when the shutter is pressed. Some of the commonly used shooting modes include shutter priority, aperture priority as well as program and manual modes. ISO is a measure used to determine the sensitivity of the camera’s sensor towards light. The term ISO originated in film photography. It is useful where film of different sensitivities is used depending on the shooting conditions. It is used in the same way for digital photography. The ISO sensitivity ranges from low to high sensitivity. It is represented numerically from ISO 100 to ISO 6400 and beyond. ISO is capable of controlling the amount of light that the sensor requires for achieving a given exposure. A digital camera needs to calculate the exposure when the photographer takes a photograph using any form of automatic exposure. It evaluates the entire scene and determines the exposure such that all the tones within the entire image average to 18% grey which is known as middle grey. This process is known as metering. Due to metering, the digital camera tones down or scales up the brightness of the image depending upon the lighting conditions. Irrespective of the shooting mode and ISO used for capturing a picture, the photographer needs to get the subject into focus. The required image result cannot be achieved if that subject is not in focus. 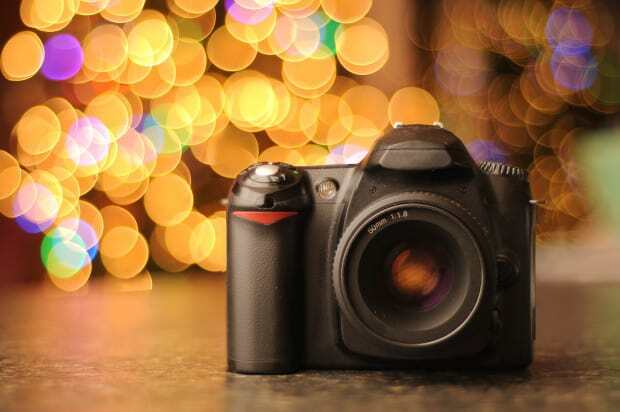 Most DSLR cameras provide the option to change the file size and type of the image when the user is taking a photo. The users set different file sizes in DSLR cameras such as large, fine or superfine. Choosing proper file size is beneficial for making the most of the mega pixels that the image has. It is preferable for beginner photographers to start using JPEG when they are taking photographs from the best DSLR cameras. The JPEG mode is straight-forward, so it allows photographers to get the best results when they are learning basics on the best DSLR cameras for beginners. It is imperative to set the white balance before taking a picture when shooting in JPEG. The white balance settings can impact the colour tones of the photographs significantly. For instance, the white balance is responsible for creating a bluish tone in images. The photographer can make proper adjustments to the images when editing the captured images on the computer. When shooting with a DSLR camera, most beginner photographers prefer using its automatic mode. However, to get high-quality photos from the best professional cameras, the photographer needs to follow these tips. With these tips, the beginners will be able to master the skills required to get incredible photos from the best DSLR cameras. The photographer should focus on them rather than the landmark behind them when photographing people. They need to use the camera’s zoom such that the frame is filled up with the subject. This will make the photo more compelling than a photo of someone who is standing far away from the camera. In contrast to posed shots, the candid photos may turn out to be the best shots taken from a professional camera. Instead of taking pictures of people standing stiffly with their best smiles, try capturing the same group when they are cracking up. This will give a more memorable shot to the photographer. Similarly, the photographers need to shoot discreetly from a distance using the zoom feature to capture the innocence of a child. Sunshine is an essential requirement for outdoor photography. However, direct sunlight can result in stark photos of people squinting. Avoid sunlight for such group photos and instead take pictures on a cloudy day. Otherwise, position the subjects such that they are in the shade and turn on the flash mode. This will spread the sunlight around the subjects and make them look natural. Many photographers experience some lag when they press the shutter button on their digital camera. To capture that perfect shot, the photographer needs to use the camera’s burst mode. With this feature, they can shoot several photos rapidly and provide the freedom to choose the best-captured moment. Another method to shoot a perfect photo is to focus ahead of time. For instance, this feature allows photographers to aim at a moving subject and press the shutter button halfway. After that, he needs to wait till the camera sets its focus on a moving subject and press the button down completely as soon as it comes into the frame. In this mode, the photographers can take extreme close-ups of small objects like flowers and insects. It alters the camera’s focus settings and enables photographers to get an extremely close view of an object. So, this is an overview of the different features that are useful for beginners to master the photography skills with the best DSLR cameras. Amateurs don’t need to start using all these features immediately but instead explore and experiment their creativity with the best cameras. While choosing the best professional camera for purchase, it is necessary to consider those from top brands like Olympus. The Olympus digital cameras are considered as the best DSLR cameras for beginners who have started learning photography. So, get the best professional camera and create some fabulous compositions while learning photography.